British Colombia offers a wide variety of amazing destinations for a summer road trip. Whether you are heading to Yoho National Park in the Canadian Rockies, the Great Bear Rainforest along the Central Coast, the Okanagan Valley, or the Haida Gwaii Islands, the 2017 Ford Edge is the perfect travel companion for you and your family or friends. The 2017 Ford Edge has the space and the features that will make your summer road trips pleasant and enjoyable. A mid-size two-row SUV, the Ford Edge has comfortable seating for five people, plus a generous 39.2 cubic feet of storage space behind the second row. That’s plenty of room for everyone’s clothes, plus any camping equipment and other recreation gear. The available hands-free tailgate makes it easy to access your stuff when you need to. The 2017 Ford Edge is available in four different models: SE, SEL, Titanium, and Sport. The 2017 Edge is solid and stable on the highway as you drive to your destination. 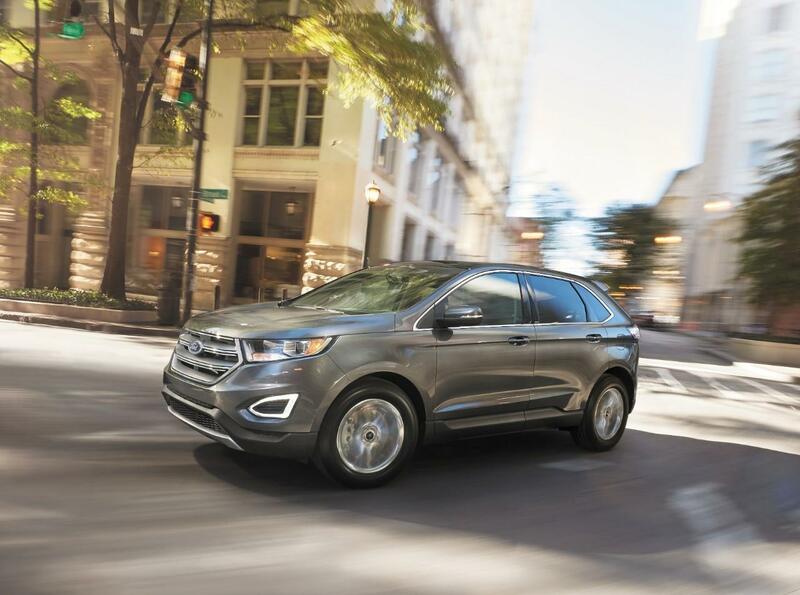 And if your trip should take you off the road and into the back country, the Ford Edge’s available Intelligent All-Wheel Drive (standard on Sport) will get you there safely and securely. Standard features like AdvanceTrac with roll stability control and curve control, and the four-wheel anti-lock brake system will protect you in rough terrain. Sync 3 is Ford’s new, easy-to-use voice-activated technology. It is available on the Edge SEL model, and standard on the Titanium and Sport models. Sync 3 pairs with your smartphone using Bluetooth for easy, hands-free calling. With its simple, easy to understand touchscreen, it can also control your music selections, whether from the radio, your personal music from your phone, or from phone apps like Pandora. Sync 3 also has Apple CarPlay and Android Auto built in, so it’s ready to take advantage of your phone’s functionality. You can even control the Edge’s navigation system with voice commands through the Sync 3 interface. It’s a very helpful system to have on your summer road trip! The Ford Edge has large windows all around for excellent visibility as you travel across our great province. And for a better look at some of our larger natural and man-made wonders, the Edge’s available Panoramic Vista Roof gives you a truly amazing view of attractions that extend above the horizon. You won’t miss a thing! The 2017 Ford Edge has six airbags as standard equipment: driver and front row passenger front and knee airbags, plus side-impact airbags with a rollover sensor. Also available are inflatable rear safety belts for the second row outboard seating positions. Available driver assistance systems include Blind Spot Information System with cross-traffic alert and a lane-keeping system. A 2.0L 245-horsepower EcoBoost turbocharged four-cylinder is standard on SE, SEL, and Titanium models, with an optional 3.5L 280-horsepower V6 available as an upgrade. The most powerful Edge powerplant is reserved for the Edge Sport model. It is a 2.7L 315-horsepower EcoBoost turbocharged V6 with standard all-wheel drive. All Edge engines come with a six-speed automatic transmission, complete with paddle shifters. You can count on a 2017 Ford Edge from Van Isle Ford in Port Alberni to get you where you want to go, then bring you safely back home. Contact us for a thorough test drive, and see where a Ford Edge can take you this summer!